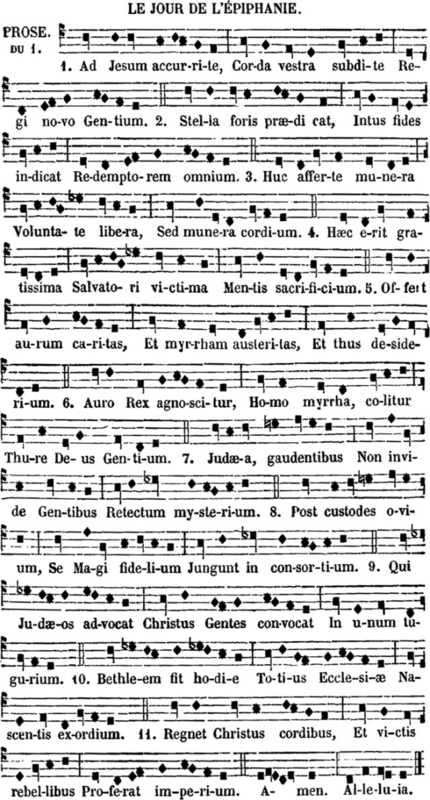 The Schola Sainte Cecilé has just published on their Youtube channel a recording of the sequence for Epiphany from the Parisian Missal of 1685, Ad Jesum accurrite; this was made during the Mass of Epiphany at the church of St Eugène in Paris. 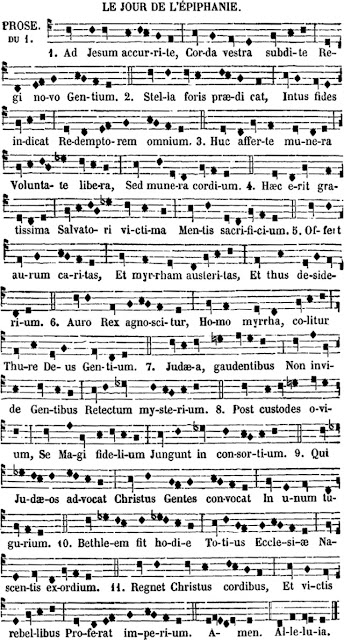 Note that the odd numbered verses are “sung”, so to speak, by the organ, a practice sometimes called “alternatim”, and very common once upon a time. (A single cantor sings them along with the organ, although he can hardly be heard in this recording.) Below the video, we reproduce from their website the text with notation, followed by my own prose translation. 1. Run to Jesus, subject your hearts to the new King of the nations. 2. The star preaches abroad; within, the faith shows the Redeemer of all. 3. Bring here gifts of your free will, but gifts of the heart. 4. This will be a most pleasing offering to the Savior, the sacrifice of the heart. 5. Charity offers gold, austerity myrrh, desire incense. 6. By gold, he is acknowledged as king, by myrrh, as a man; by incense, worshipped as the god of the nations. 7. Judea, show no envy to the nations who rejoice at the mystery revealed. 8. After the shepherds, the Magi join the company of the faithful. 9. Even He that calls the Jews, calls together the nations into one fold. 10. Bethlehem becomes today the beginning of the whole Church as it is born. 11. Let Christ reign in our hearts, and His rule advance, the rebellious being conquered. A reminder that Masses for Sundays and feast days can now be followed live from St Eugène at the Youtube channel Ite, Missa est: https://www.youtube.com/channel/UCIz1_vK-gfwd26Q3cIvDxPg.